There is not much difference between canine, feline and human teeth. We all grow a set of baby teeth that eventually fall out to allow adult teeth to settle in. Also, we share a similar network of nerves and blood vessels around our teeth, surrounded by dentin, which is then surrounded by a hard coat of enamel.2 Our pets’ teeth get bathed in saliva, bacteria and food particles that eventually form plaque. Then, minerals within the saliva bond with the plaque, giving way to tartar, a hard substance that adheres to teeth if not taken care of properly. Professional cleaning is needed to remove plaque and tartar that develops below the gum line. Although there are canine dental products available at several pet shops, such as toothbrushes and paste, it is very difficult to train dogs, and even harder for a cat, to tolerate frequent brushing and cleaning. A veterinary dental cleaning is the best choice to remove tartar from pet’s teeth and under the gums to protect their health. The problem with tartar is that it helps bacteria to grow under the gums, causing gingivitis, which is reversible if found in its early stages. If not addressed properly, bacteria starts destroying the supporting tissue around the tooth, leading to tooth loss or periodontitis. Periodontitis is not reversible and once it enters the animal’s bloodstream it infects other organs, like the heart, kidneys and liver. Feel free to browse though our full line of veterinary instruments by clicking the button below. 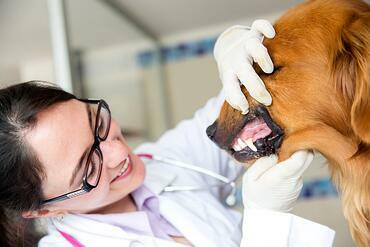 1 Dental Cleaning for Dogs and Cats. (2014, February). 2 Riggs, Rex Dr. (2010, February). Guest Post: Why have your dog’s teeth cleaned by a Vet anyway? 3 Pet Dental Care. (2016). 4 AAHA Dental Care Guidelines for Dogs and Cats. (2016). 5 Shafford, Heidi DVM. (2014, June). Why it’s Important to Have Your Dog’s Dental Cleanings Performed Under Anesthesia.